It has become an article of faith on the left that President Donald Trump is a racist, voted into office by legions of White supremacists who want to put Blacks back into chains and ship Hispanics back to Latin America. If this is the case, than Donald Trump must very bad at being a racist and his racist supporters must be very disappointed in him. According to the Washington Examiner, more Americans are saying they are better off under Trump, especially Blacks and Hispanics. The improving economy has helped President Trump keep the support of his “base” of 2016 voters strong, and is opening the door for blacks, Hispanics and younger voters to join them. Citing those results in new surveys, Democratic pollster John Zogby is declaring that Trump will be tough to beat in 2020 despite his high disapproval ratings. “President Donald Trump’s support is actually increasing among voters and offers data to explain why he may be re-elected in 2020,” he said. In a blog post, Zogby, who co-writes the weekly Trump report card for Secrets, noted that more and more Americans believe they are increasingly better off since the president took office. “More than two in three (68 percent) tell the pollsters that the economy is strong, while 32 percent say it is weak – and this includes 76 percent of men, 61 percent of women, 64 percent or more of all age groups, 57 percent and 58 percent of Hispanics and African Americans respectively, and 63 percent of political moderates,” blogged Zogby citing a new Harvard University-Harris poll. “More voters say they are doing better off in their personal financial situation (31 percent) or about the same (38 percent) than the one in four (25 percent) who say they are doing worse off. The ‘better off’ crowd includes the 30 percent of Hispanics and 33 percent of African Americans,” added Zogby on the Forbes website. Of course, presidents don’t actually have that much control over the economy and things were getting better before Trump took office, but Trump’s tax cut and attacks on excessive regulations are helping the economy grow. More importantly, since a lot of economics is actually a matter of psychology, having a president in the White House who is definitely on the side of the job creators is a lot better than having a president who talks about spreading the wealth around. Maybe, Trump is not actually racist at all. Or maybe it does not matter if he was slow to renounce the various racists and white nationalists who expressed support for him. Maybe what is important are President Trump’s policies which seem to be helping every American, particularly Black and Hispanic Americans. I have noticed that the people who claim to the greatest fighters against racism, the ones who are always accusing conservatives, and Americans generally, of being hopelessly racist, tend to support the sort of liberal policies that have been absolutely catastrophic to the Black community. The same people on the left who are always on guard against every vestige of racism support the Democrats whose mismanagement have turned many Black neighborhoods into crime-ridden wastelands. These leftists who want to help the marginalized and disadvantaged have done more damage than the worst Grand Dragon of the Ku Klux Klan or the segregationist politicians of the Old South could have imagined. Maybe actions are more important than words and maybe it is better to do the right things than to merely say the right things. Ben Cohen of Ben & Jerry’s Ice Cream has a new project he’s been working on. Unfortunately, it has nothing to do with ice cream but involves repealing or amending the first amendment to end our free speech protections. This might seem like a stretch and certainly Ben doesn’t believe that he is doing any such thing, but he may not have thought through what his efforts to get the money out of our politics might actually entail. This is Ben Cohen, the “Ben” of Ben & Jerry’s ice cream. For the past few years, I’ve run a national, grassroots campaign to get Big Money out of politics. It’s called Stamp Stampede. 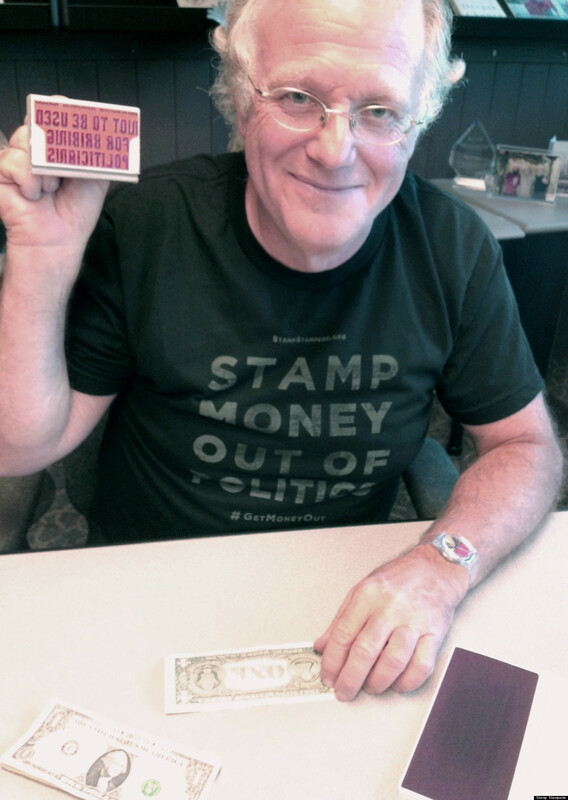 And the way it works is simple: activists around the country stamp—and then spend—dollar bills with a simple message, such as “Amend the Constitution—Stamp Money Out Of Politics.” Want a stamp? Just click here, donate $10 or more to help MoveOn’s campaigns to stamp money out of politics, and I’ll send you a stamp! If just 5,000 MoveOn members (out of 8 million of us) get a stamp—and stamp one bill every day for one year—our message will be seen 1.6 billion times. 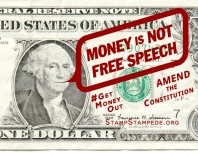 Each dollar bill that’s stamped directs people to a website where they can join the fight to overturn Citizens United. Together, we can get our message in front of millions of Americans and bring in droves of new money-in-politics activists each year—which is what it’ll take to win this long-term fight. Click here to get your stamp for a donation of $10 or more—and help build the movement. What does money have to do with free speech and why would getting the money out of politics threaten it? Well, to start with, it costs money to run for public office. Either an aspiring candidate may spend his own money to fund his campaign or he may solicit others to donate money. There are not many people wealthy enough to spend their own money to fund a political campaign on the national or even the state level and most people would consider a government made up of only the very wealthy to be undesirable, therefore there will always be a need for politicians to request donations from those who for various reasons are willing to give them money. No campaign finance legislation can change that simple reality. In fact, most proposals for getting the money out of politics seem to be aimed at getting the other side’s money out of politics. We are funded by small donations from ordinary people who wanted to make this country a better place. They are funded by millionaires and billionaires who want to protect their own greedy interests. Somehow, for all the fuss the progressives make about the nefarious Koch Brothers, they never seem to be bothered by the money George Soros spends on politics. The first amendment guarantees our freedom of speech. It does not require anyone to provide us a forum for our speech. If an individual or a group wishes to have some impact on the political process by speaking for or against a given policy, law, or candidate for office, they must spend money to get their message out. They must purchase advertisements in printed periodicals or on broadcast media. They must print pamphlets, create audio visual media, etc. They may have a staff of volunteers, but at some point, they may find it desirable to have people working full time on the cause. These people have to be compensated for their time and efforts. More recently the rise of the Internet and digital broadcasting and published has made the process of getting a message out cheaper and more democratic. You do not need to own a newspaper or television station to influence events anymore. Still, if you want to be really effective, you still need to spend some money. Yes it is. Free speech is not free. Like the politician seeking office, an individual or group seeking to get a political message out can spend their own money or solicit donations from people who support the individual or group’s goals. If the government can control and limit the funding of any political advocacy organization, it can effectively control and limit its speech. It does little good to guarantee freedom of speech if you prevent people from using that freedom in any sort of really effective manner. Indeed, this is a far more effective method of controlling dissent than the gulag. What good does it do to have the freedom to speak out if the only audience you are permitted to reach is a small circle of acquaintances? A dissident in a gulag may still be somewhat dangerous since he gets some attention and can even be regarded as a hero. A dissident who no one ever hears of is no danger to anyone. Ben is probably sincere in his desire to limit the influence in our politics but there will be money in politics as long as their is politics simply because politics requires money. Attempting to control the flow of money in politics will always tend to benefit some factions and parties at the expense of others. Controlling the money used to publish speech can be used to control the speech. This is not to say that we should have no campaign finance laws, but, as in everything else good intentions do not justify bad results and you must be on the lookout for unintended (or intended) consequences. Ben should stick to making ice cream. Ben and Jerry, of Ben and Jerry’s Ice Cream, have a petition from Moveon.org that they want me to sign. It’s Ben and Jerry—the co-founders of Ben & Jerry’s Ice Cream—and we need your help. Here’s the truth: We don’t need this stupid tax cut. As we recently wrote in an op-ed in USA Today, we’re wealthy thanks to the good fortune of our efforts—but also because of many other societal factors that contributed to our wealth.1 The estate tax is one of the ways that the wealthy pay forward so the next generation has the opportunities we had. The estate tax, which the U.S. has had for more than a century, currently affects Americans with estates worth at least $5.4 million, or $10.8 million for a couple—only 1 out of every 500 taxpayers.2 And yet, it’s been a target of right-wing lawmakers, working on behalf of their wealthy donors. Click here to sign our petition calling on Senate Democrats to stand united and stop this Republican giveaway to the superrich. Congress has shrunk the estate tax in recent years—and now the Senate and House, in advisory votes largely along party lines, have voted to repeal it entirely.3 The votes are only advisory, for now, but when the Republicans press this issue again, Senate Democrats will need to be ready to beat back the repeal and block this latest Republican giveaway to the superrich. Good grief, Congress. With all this going on, are you really going to give another tax break to those of us who need it least? Sign our petition—tell Senate Democrats to stand united and ensure that Republicans don’t give multimillionaires and billionaires even more tax breaks. 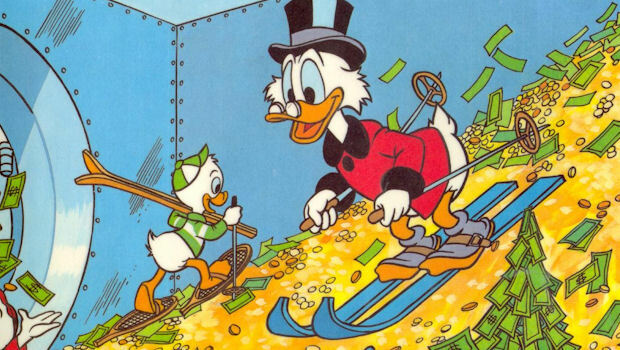 I always find it fascinating when millionaires and billionaires write editorial pieces demanding higher taxes for themselves because it is such an obvious exercise in hypocrisy. They want to get credit for a generosity and benevolence they do not really have. If Ben and Jerry think that they are not contributing enough with the taxes they pay, they are perfectly capable of writing a check for any amount they want. If they sincerely believe the the federal government can make better use of their money than they can, they can give away their entire fortune. It’s their money that they have earned. They can do what they want with it. It may be that other people who have been successful might believe that they have contributed quite enough already and that they can do better things with their money than give it to the federal government. Ben and Jerry don’t seem to want to give them that option. Seen that way, Ben and Jerry’s offer to pay higher taxes shows not a generous giving of their own substance, but a desire to impose their own priorities on others. An estate or inheritance tax is simply a tax levied on wealth that is transferred by inheritance. This tax is assessed when the owner of the property to be transferred dies and his will takes effect, hence the estate tax is often called the death tax, especially by those opposed to it. The estate tax levied by the U.S. government does not affect many, only 0.2 percent of the population and it is not a major source of revenue for the government. The receipts from the estate tax makes up less than one percent of the total revenue collected by the government. It isn’t likely that repealing the estate tax will cause a fiscal crisis. In fact, it is possible that the estate tax, as it is currently configured is not worth the effort of collecting it. It may be that if the heirs to an estate were permitted to keep the entire estate, the wealth they would generate through investments, etc word yield more tax revenue for the government through the income and capital gains taxes than the revenue from the estate tax. I imagine that is the thinking behind the efforts to repeal the estate tax. I do not know if this argument is valid, since I am not any sort of expert on tax policy. Even if the analysis is true, it does not necessarily mean the estate tax should be ended. The current estate tax in the U.S. was enacted in 1916 not so much to generate more revenue for the federal government as to prevent the emergence of a hereditary class of the super rich who would pass down an ever increasing share of the nation’s wealth from generation to generation. Oddly, even many of the wealthiest men in the country supported the idea of an inheritance tax at the time it was enacted. Andrew Carnegie argued against rich men leaving large fortunes to their children on the grounds that it was doing them no favor to allow them to coast through life as the idle rich on their father’s inheritance. Carnegie and others of his class had worked their way up from the bottom and they believed that their children should have the same opportunity to work to get ahead. I am not sure that the estate tax, as it is currently configured really accomplishes this goal. As Ben and Jerry pointed out, only amounts above a certain limit, $5,430,000 in 2015, are subject to the estate tax which is assessed at a progressive rate from 18% to 40%. If I were to die and leave an estate worth $100,000,000 to my heirs, they would still get roughly half of the estate after taxation In fact, the administration of the estate tax seems to be very complicated, if the Wikipedia page is any indication, and it is possible for a clever person to arrange his finances in such a way as to pay little or no estate tax. If we really wanted to discourage large inheritances, the estate tax ought to be raised, perhaps to confiscatory rates above a certain level of wealth and we would tighten up the rules regarding gifts given before death and trusts. There is a persistent myth in politics that the problems of this country have simple, commonsense solutions that everyone would agree to if it were not for the selfishness and greed of special interests. In fact, even people with the best will can disagree over policies. I think the debate over the estate tax proves the lie to this myth, since there are very good arguments both for and against it. Any issue can be debated over matters of fact, whether or not repealing the estate tax will improve the public finances, and matters of values, which is more important, economic growth or economic equality. Matters of fact can be resolved fairly easily but arguments over values tend to be intractable. If you believe the government should promote equality, you will probably favor keeping the estate tax. If you believe economic growth is more important and can be promoted by lowering taxes, you might favor repealing it. Both sides have different opinions on what is important or desirable and both sides may well be trying to do what is best for everyone. One need not assume that they only want to give away money to the wealthy, as Ben and Jerry do, or have nefarious plans to redistribute all the wealth in this country, as some of President Obama’s critics seem to believe. As I said, there are good arguments on both sides and I do not know enough about tax policy to really have a strong opinion on the estate tax. I do think that Ben and Jerry should stick to making ice cream. To start with, Marie Antoinette never actually said it. The phrase is actually found in Jean Jacque Rousseau‘s autobiography, Confessions where at one point he claims that “a great princess” upon learning that the peasants had no bread made the famous statement. Rousseau couldn’t have been speaking of Marie Antoinette, however, because his Confessions, although not published until after his death, was completed by 1769 when Marie Antoinette was still a girl living in Vienna. Which great princess, if any, Rousseau was actually referring to is unknown and since Rousseau adhered to the”fake but accurate” school of historiography so beloved by progressives it is possible that he simply made the whole thing up. In any case, the statement was actually out of character for Marie Antoinette. Despite the caricature of the callous, out of touch aristocrat created by the French radicals, Marie Antoinette was aware of the plight of the French poor and gave generously to charity. She was extravagant in her spending and could be somewhat clueless about what political advisers would call today the “optics” of the royal administration. Even if she did say it, Marie Antoinette didn’t really say, “let them eat cake”. That is poor translation of the actual statement in French, “Qu’ils mangent de la brioche“. La brioche is not really cake but a kind of bread made with eggs and butter to give it a light texture and rich flavor. Brioche was more expensive than the plain flour and water bread that the French poor subsisted upon, so perhaps a more exact translation might be, “if they don’t have the plain bread, let them eat the fancy pastries”. Somehow, that just doesn’t have the same ring to it. The meaning behind the words let them eat brioche may not be quite what it is generally assumed to be. It generally is taken to refer to a ruler or government callously unconcerned about the poor, but the pre-revolutionary French monarchs were greatly concerned about the welfare of the French people over which they ruled. As I said, the French poor depended on cheap bread to survive and the French government tightly regulated the supply of grain and flour to ensure that they had a steady supply of bread. There were strict regulations and inspections to ensure that bakers did not adulterate their bread to save money on flour. The price of the cheapest bread was set by the government to be affordable to the poor. 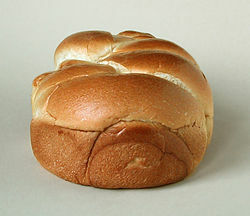 Since bakers might be tempted to produce only a limited supply of the cheapest bread, and concentrate on more expensive and profitable pastries like brioche, French law required that if a baker ran out of the cheap bread, he was obliged to sell his more expensive wares at the set price for cheap bread. So, if Marie Antoinette had said let them eat cake, what she meant was that if there was a shortage of the cheap bread that was the staple of the poor, they should the have more expensive bread made available to them. This system worked well enough in times of plenty, provided that the government set the price of the cheapest bread at a level that ensured that bakers could make a profit. If there was a bad harvest, however, the price of grain and thus of flour would increase. Since the price of bread was set and could not be changed, bakers could find themselves selling bread at a loss. The bakers were supposed to be compensated for their losses when good harvests return, but they had no way of knowing when that might be. Under the circumstances, they might well decide to not to bother making any bread at all, leading to worse food shortages. Now, a free market advocate might suggest that the French government ought to have ended its price controls on grain and bread and let the free market determine the cost and supply of bread. Over the long term, the equilibrium between supply and demand would ensure a stable supply of bread at a reasonable price. In fact, that was exactly what was happening in the early years of the reign of Louis XVI. Influenced by the writings of the French school of economics known as the Physiocrats, who advocated free trade and free market economics, and by Louis’s minister Turgot, the French government had been slowly dismantling the system of price controls and strict regulation of bread in the early 1770’s. Unfortunately, this was also a period of bad harvests which drove the price of grain and then bread to a level beyond the reach of many of the poor. Given time, the market would have righted itself but that was small comfort to the poor who found themselves unable to feed their families. Rioting broke out all over France in 1775, leading to what has been called the Flour War, a sort of pre-revolution. At first the rioters attacked grain merchants who they suspected of hoarding grain, but it wasn’t long before they were fighting with Royal officials. Both the traditional view of the King as protector of his subjects and the free market economics endorsed by Turgot were discredited in the chaos and Turgot was obliged to resign. King Louis XVI restored the price controls on bread and organized relief for the areas most afflicted by hunger. By the summer of 1775 the Flour War was over, but in hindsight this the beginning of the end of the French ancien régime. Let them eat cake, then, is not really so much the rallying cry of an uncaring and callous elite as it is for a regime that enacts well-intentioned reforms to help everyone but because the unintended consequences of such reforms are not carefully considered they end up causing more harm than good. This is a lesson many contemporary Louis XVIs and Marie Antoinettes would do well to learn. Growing up, you might have heard your mother or father saying something like that when you wanted some expensive toy. Maybe you listened to them and learned something about where money does come from. The progressives who are pushing for minimum wage increases do not seem to have listened to their parents. At least it doesn’t seem to occur to them that if the government creates an increase in the cost of business, such as raising taxes or requiring higher wages, the money to pay for the increased costs has to come from somewhere. Either a business must pass on the increased cost to its customers by increasing prices, adjust its practices to reduce impact of the higher costs, perhaps by employing fewer workers, or accept a reduction in profits. For many of the unthinking, the last option is the most desirable, since it is all too commonly believed that profits are somehow selfish and evil. They do not realize that a business’s profit is what the owners of that business get to meet their own expenses and is the repayment for the expenses and risks of starting and running the business. This is especially true for the small business person who is the sole owner of his business, but it is also true for the stock holders of a major corporation. It a business cannot make a profit it must eventually cease to operate and close its doors. It really doesn’t require a PhD in economics or business administration to understand all of this, only the ability to think things through, an ability sadly lacking in all too many. Consider this example, brought by ABC News, of a bookstore in San Francisco, closing due to an increase in the city’s minimum wage. Independent bookstores have faced tough times for quite a while. In San Francisco, neighborhood businesses have been passionately protected, so it’s hard to believe that an initiative passed by voters to raise the minimum wage is driving a Mission District bookstore out of business. San Francisco’s minimum wage is currently $11.05 an hour. By July of 2018, the minimum wage in San Francisco will be $15 an hour. That increase is forcing Borderlands Bookstore to write its last chapter now. When actor Scott Cox took a job at Borderlands Books he didn’t do it for the money. The work let him squeak by while nourishing his passion for sci-fi and fantasy. “Everyone who works here does this because they love books, they love stories, and they love being booksellers,” said book store owner Alan Beatts. That’s why store owner Beatts found it so tough to post a sign in the front window that the store is closing. “We’re going to be closing by the end of March,” he said. Borderlands was turning a small profit, about $3,000 last year. Then voters approved a hike in the minimum wage, a gradual rise from $10.75 up to $15 an hour. “And by 2018 we’ll be losing about $25,000 a year,” he said. Money doesn’t grow on trees. 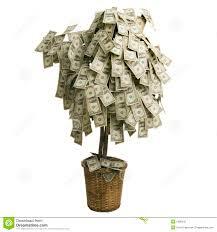 Alan Beatts cannot simply go to his money tree and shake off a few extra bills. He must come up with the money to pay the higher wages somehow. He cannot increase his prices. Small, independent book stores have long been squeezed by large chains such as Barnes & Nobles who are now being squeezed by Amazon, so any increase in prices will simply drive customers away. I doubt it his bookstore is so overstaffed that he can afford to let many employees go. He cannot continue to run his bookstore if it loses money, so the bookstore must close. The next part of this article is priceless. It’s an unexpected plot twist for loyal customers. I would say that Mr. Vallecillo wasn’t thinking at all, but then neither were the people in San Francisco’s Board of Supervisors when they decided to let people vote on increasing the minimum wage. Though it’s caught a lot of people off guard, one group that wasn’t completely surprised was the Board of Supervisors. In fact, they say they debated this very topic before sending the minimum wage to the voters. “I know that bookstores are in a tough position, and this did come up in the discussions on minimum wage,” San Francisco supervisor Scott Wiener said. Wiener knows a lot of merchants will pass the wage increases on to their customers, but not bookstores. Wiener says it’s the will of the voters. Seventy-seven percent of them voted for this latest wage hike. But Alan Beatts said he can’t see a way to avoid it. Mr. Wiener should have thought of that before, unless they repeal the increase in the minimum wage, Borderlands Books will have to close. The voters voted for the increase. Now, they will have to deal with the consequences. Business owners don’t really have money bins. Anyone who shaves on a regular basis owes King Camp Gillette a debt of gratitude. King Camp Gillette, yes that was actually his name, was the founder of the Gillette Safety Razor Company in 1901 and the inventor of the disposable safety razor. Before this invention, men shaved using a straight razor that had to be sharpened on a leather strop. These razors were expensive, needed sharpening often and were not especially safe or easy to use. There had been attempt to create safety razors out of forged steel in the nineteenth century but they were also expensive and hardly disposable. King Camp Gillette was a salesman for the Crown Cork and Seal Company, which made bottle caps for soft drink bottles, and he noticed that people would throw away the bottle caps after opening the bottles. He thought that if bottle caps could be disposable, why not razors? Working with two machinists, Steven Potter and William Emery Nickerson, Gillette designed a cheap, disposable safety razor using stamped steel. The razor was an immediate success and since Gillette’s portrait was on the packets of the razor blades, he became recognizable all over the world. Gillette’s big break come with America’s entry into World War I. Gillette contracted with the government to provide razor kits for American servicemen. Despite his success, King Camp Gillette died in poverty in 1932. He lost control of his company to a fellow director, John Joyce, though the company retained the Gillette name. Gillette spent much of the money he gained from the sale on property and when the Great Depression struck, the shares of the company lost their value. The Story of King Camp Gillette could be read as a great American success story or a rags to riches to rags story. What I find most intriguing about Gillette, however, are his social and political views. The Wikipedia article about Gillette describes him as a “Utopian Socialist” who wrote a book in 1894, advocating that industries should be nationalized and controlled by a single corporation owned by the public. It may seem incongruous for a capitalist to argue for socialism, but Gillette believed that capitalists were the natural choice to run the nationalized industries, since they already had the necessary experience. Gillette, then was a democratic socialist rather than a Marxist. He wanted a socialism that benefited everyone in the nation, not a class struggle and revolution. Gillette’s views may seem radical, but this kind of democratic, corporatist socialism was very popular at the time. In 1888, Edward Bellamy (cousin of the Francis Bellamy who had devised the Pledge of Allegiance) had published a utopian novel titled Looking Backward, in which a man from 1887 falls asleep Rip van Winkle style and wakes up in the socialist utopia of 2000. In his novel, Bellamy had advocated the same sort of corporatist socialism as Gillette and many others. Looking Backward was a best seller and almost immediately after its publication “Nationalist” clubs sprang all over the country hoping to enact such policies. Ultimately some form of this National Socialism was adopted by Benito Mussolini in Fascist Italy and certain aspects of Franklin Roosevelt’s New Deal. I have to wonder how otherwise intelligent men could imagine that creating a publicly owned monopoly to control an entire nation’s industry could possibly be a good idea or, in any way compatible with any idea of a free country. One of the major concerns of the late nineteenth and early twentieth centuries was the growth of monopolies and trusts owned by such men as John D. Rockefeller or Andrew Carnegie. Many observers believed that such men practiced unfair and anti-competitive policies which gave them a disproportionate influence over the American economy and ultimately of the government. It seemed obvious that economic power should not be concentrated in the hands of a few men. Why then, was the solution to this concern considered to be the concentration of economic, political, and legal power in the hands of a few. The National Corporation that Gillette and others envisaged would be owned by the public, but the public wouldn’t be administrating the corporation on a daily basis. There would have to be some sort of committee of directors with perhaps a sort of CEO. Such directors would have far more control over the economy and the government than any private businessman. They would effectively own the whole country, even if nominally it was owned by the public. Even the most benevolent saint would be tempted to abuse such power, to benefit his friends, and the people who would aspire to such positions would not likely be saints. I have similar reservations about the people who seem to believe that a bigger, more expansive government is the solution to all the nation’s problems, the sort of people who are always proposing new laws and regulations believe that a new government program is always the answer. I can understand that giving more power to the state will allow it to do more good for everyone, but why can they not see that it will also allow the state to do more evil. Given the defects of human nature, which inclines more to evil than to good, my personal preference is to leave the good undone rather than risk the evil that will certainly be done. I have always rather liked the melody of John Lennon’s Imagine. I cannot say, however, that I especially like the lyrics, expressing as they do every idiot left wing idea imaginable. It turns out that I am far from the only one who finds the lyrics objectionable. Mark Davies, the Catholic Bishop of Shrewsbury in Birmingham, England expressed his objections to the song in his Christmas sermon. John Lennon’s famous song “Imagine,” which pines for a Marxist utopia devoid of property and religion, lyrically promotes the “ill-founded belief” that “religion is the cause of wars,” when the devastatingly brutal wars of the 20th century were “largely inspired by secularist” and “openly anti-Christian ideologies,” says Catholic Bishop Mark Davies in his scheduled Christmas Day sermon. Bishop Davies oversees the Catholic Diocese of Shrewsbury in Birmingham, England. This 2014 Christmas marks the 100th anniversary of a Christmas “truce” during World War I when British and German soldiers, after an appeal by then-Pope Benedict XV, ceased fighting for a day and actually exchanged greetings and gifts and played soccer on the battlefield. “[I]t was surely a light which first shone with the birth of a child born in Bethlehem, a Savior given to all humanity who turns our minds to thoughts of peace,” says the bishop. The idea that religion is the cause of war has been heavily promoted by the so-called New Atheists to justify their anti-theist positions. It is a simplistic idea and easy to believe. It is not true, however. Religion is often the pretext for war. It is not so often the sole cause of war. A quick survey of the many wars throughout history shows relatively few wars are really over religious differences. The Peloponnesian War, the Hundred Years War, the American Civil War, World Wars I and II and many, many others had little to do with religion, even if the combatants believed that God was on their side. Even wars that are fought over religion, such as the Wars of Religion during the Protestant Reformation, on closer examination reveal other motivations, political or opportunistic, are at work. The German Princes who supported Luther were genuinely opposed to the abuses of the Catholic Church, but they were also inspired by German nationalism and a desire to maintain their own power against the imperial pretensions of the Hapsburgs. The Islamic hordes who burst out of the Arabian Peninsula may have been religious fanatics, but they were also attracted by the prospect of booty. But, I think there is more to object to John Lennon’s song than just the anti-religion themes. Consider the lyrics. John Lennon may have been a dreamer, but he doesn’t seem to have been much of a thinker. He wanted everybody to live in harmony together, yet he sings against the institutions that help people to live together in peace. What if there were no countries? Would all the people live together in harmony? In Stone Age cultures people do not live in countries, or nation states or formal government. They effectively live in a state of anarchy recognizing no loyalty higher than that of the clan or tribe. People living in such primitive culture tend not to live peaceful lives.Their lives are far more violent than that of people living in more advanced societies. How could it be otherwise? When there is no higher authority to settle disputes between tribes, they often must fight feuds. When there are no police, courts or jails, the only way to assure justice is the threat of revenge by kinsmen. When people began to organize into cities and kingdoms, their rulers found it expedient to discourage private violence by adopting law codes and having the state administer punishment for crimes. When the nations of Europe began to coalesce into centralized nation states in the fifteenth and sixteenth centuries, one major concern of kings was to eliminate the private wars that was the nobility’s prerogative in the Medieval Period. The kings fought wars against each other but their subjects had to be at peace. The result was larger, but fewer wars. In the last few decades, we have begun to develop ways of mediating between nations and a somewhat crude form of international governance which has made war between the major powers almost unthinkable. Perhaps this idea should be taken to its logical outcome and a world government instituted to keep the peace, but I think that the disadvantages far outweigh the advantages of such a system. The point is, that the development of nations and countries has actually made life more peaceful for most people throughout history. A world of people living in anarchy would not be harmonious. What about possessions? If we had no possessions would there be no hunger or greed? I don’t see how it would be possible to avoid starvation. Food is, after all, a possession and if there were no possessions there would be no food. And why would anyone take the trouble to grow more food than he needed to feed himself and his family if there were no way to pay him? Why would anyone want to do anything? Maybe John Lennon meant that everything would be held in common. Would this lead to harmony? Aristotle understood more than 2300 years ago that private property is essential for maintaining peace and prosperity. As he put it, people are naturally self-interested and so more interested in caring for and improving what they perceive as belonging to them, while neglecting the affairs they see as others’ responsibility. Private property creates a more harmonious society since things held in common tend will be fought over. Everyone would naturally take as much as they need from the commune while contributing as little as they could get away with. No matter what system would be set up to distribute the common goods, someone would be sure to feel they are not getting their fair share. There is peace when property ownership is clearly defined with clear laws protecting property rights and commerce. Most of the rich countries of the world have such laws and are relatively peaceful and stable. Most of the poor countries lack such laws and are unstable and turbulent. I am afraid that John Lennon’s dream would not lead to a world of everyone living together in harmony. It would lead to a Hobbesian nightmare of all warring against all and lives nasty, brutish and short. Maybe we should imagine less and think more.